Foodie Friday! 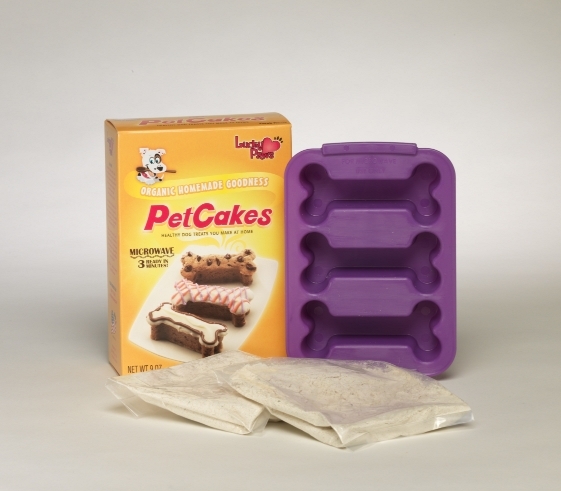 PetCakes by Lucky Paws Enter to win! Today I am happy to share with you a DELICIOUS treat I was lucky enough to try, PetCakes by Lucky Paws! 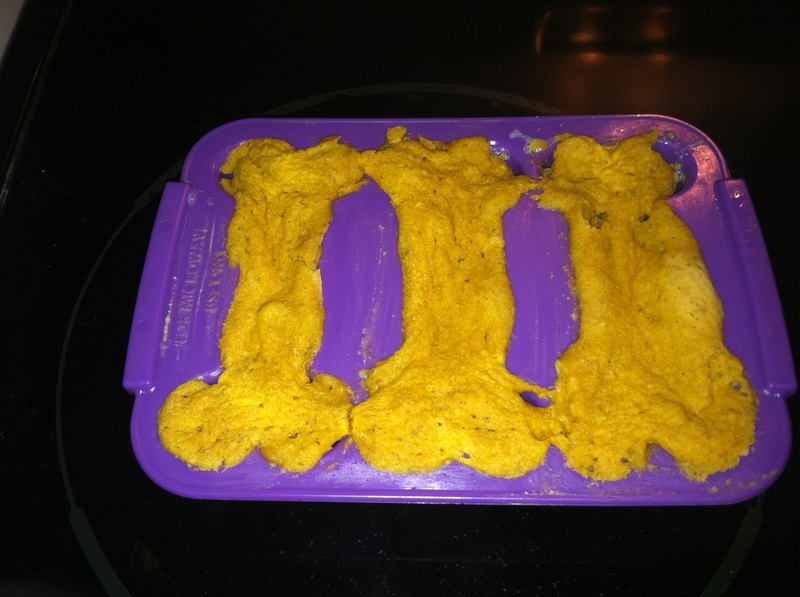 They are the FIRST EVER microwavable dog treats! They were created by Melinda Kirk (who is the founder and CEO), and PetCakes are made of all natural and organic ingredients! One of the coolest parts? They can be microwaved in LESS than 3 minutes! 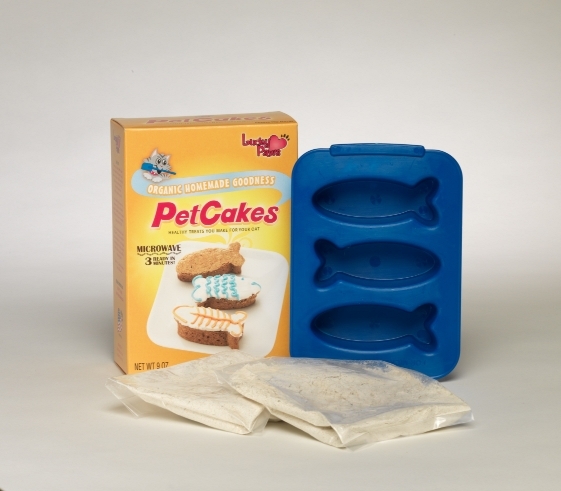 PetCakes achieved Best New Product of the Year 2010 at the Global Pet Expo!! There is NO SUGAR, SALT OR PRESERVATIVES in their products! They are also Veterinarian Approved! Here is where Mom screwed up. She made the Original Carob for my birthday and guess where the photos are? They are in her FRIED computer that we told you about a few days ago. Once Mom uploaded the photos from her camera the brainiac DELETED THE PHOTOS! So we don’t have those for you. Mom decided to make one of my refill packs so that she could take new photos for all of you! The pack she made was PIZZA FLAVOR! YUM! PetCakes couldn’t be easier to make! You just mix one packet of dry mix, 1 tablespoon ketchup and 1/3 of a cup water. Then you microwave for 2 and a half minutes! Even my Mom can handle that! Once they come out of the microwave you have to wait 10 minutes for them to cool. 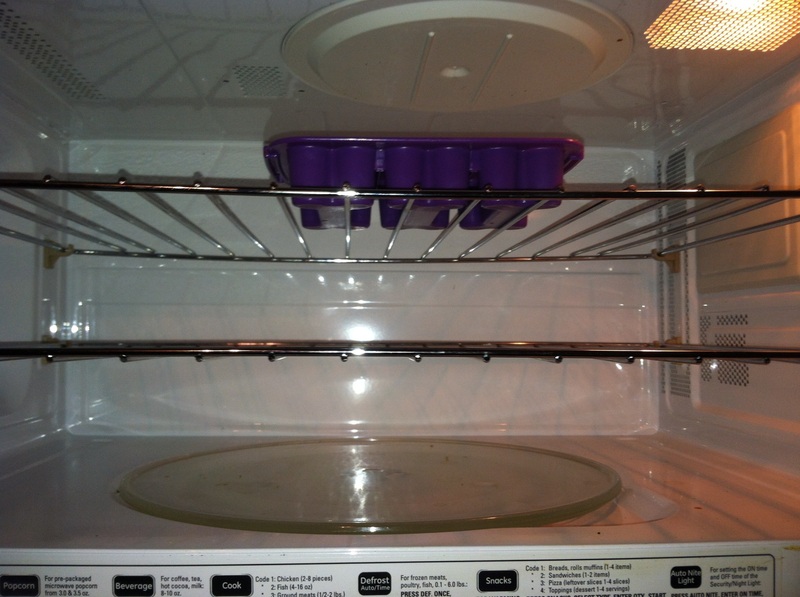 To keep the treats fresh you can refrigerate them for up to 1 week or freeze for 2 weeks. 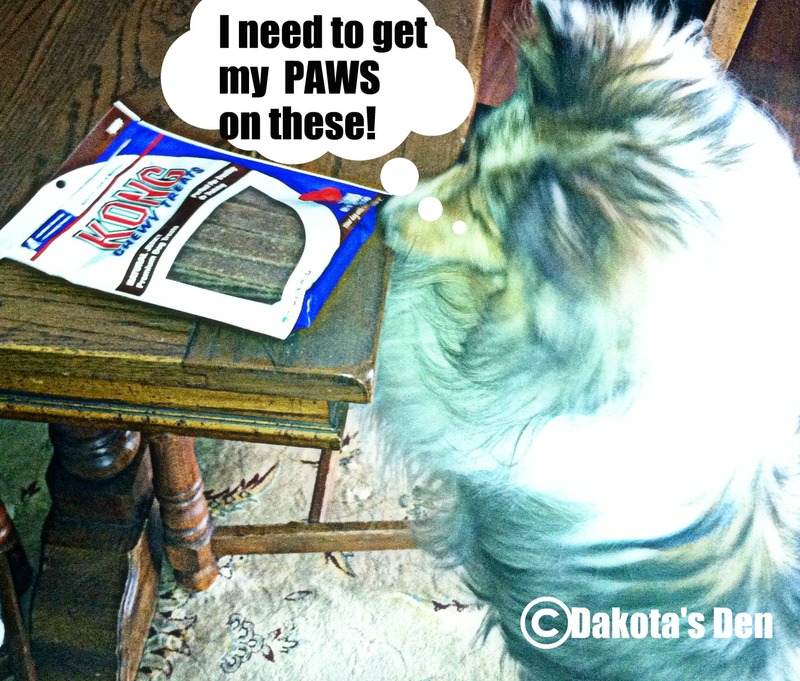 Dakota gives these 4 paws up! Where can you purchase them for your dog? Click here and find out! PetCakes also has cakes for CATS! I saved the BEST for LAST! Our furiend, Melinda, was kind enough to offer my readers a GIVE-AWAY! HOW TO ENTER: You must tell me in a comment that you would LIKE to be entered and if you would like the dog version or cat version! That’s it! The give-away starts NOW and will end on MONDAY APRIL 1ST, AT 5PM. WINNERS WILL BE SELECTED BY http://www.random.org and will be ANNOUNCED WEDNESDAY, APRIL 3RD. KONG® NEW Premium Treats! ENTER TO WIN! Hi everyone it’s Dakota! 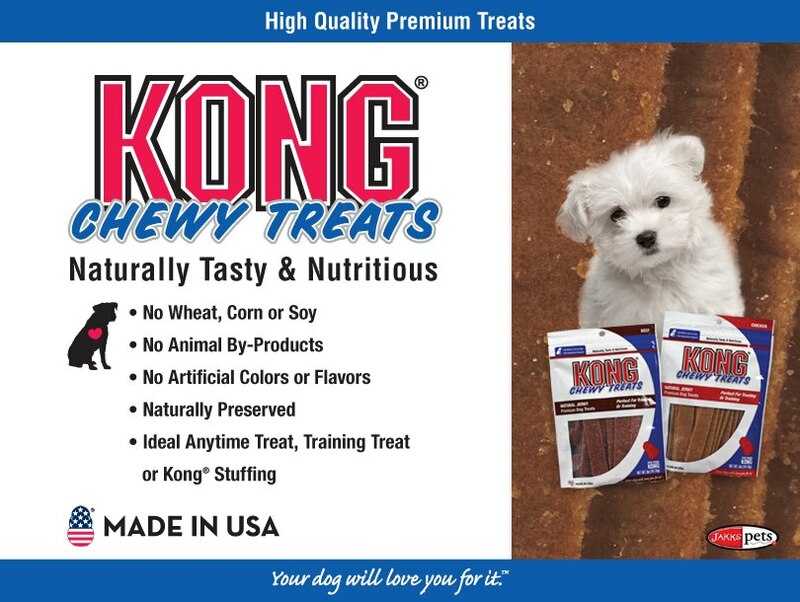 I can’t begin to tell you how excited I was when my furiends at KONG® “one of the most trusted and capable names in the Pet Industry” , contacted me and asked if I would like to sample some of the treats from their NEW Premium Treat line! click on photo to visit the KONG website! I was particularly excited to receive the above two items because I needed my jerky fix! Mom and I have read about all the recalls of jerky items made in China and we needed jerky that was made in the good ‘ol U.S.A . that would be safe for me and you! Each product in the Premium line was developed with specific attention to common pet needs including Oral Care, Skin & Coat maintenance and Allergy Concerns. KONG® Treats are Vitamin Enriched and contain extra anti-oxidants to help improve overall health. 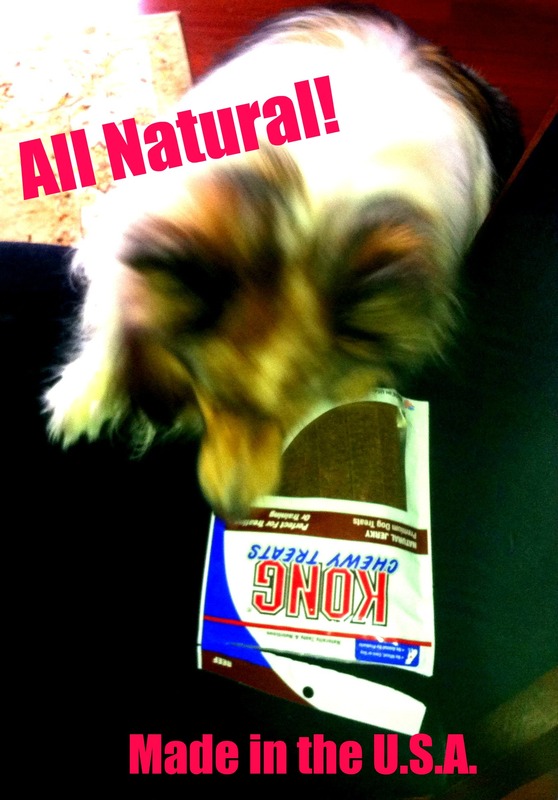 KONG’S Natural Jerky Beef Strips and Natural Jerky Chicken Strips are part of the KONG Premium Treat line. They are SUPER great tasting too!! They are also a treat that my Mom can feel GOOD about giving me! They are fabulous for treat time, training, rewarding and even for stuffing KONG® toys!! I bet you want some of these treats too, don’t you? Well our furiends at KONG® are going to give SIX LUCKY PEOPLE IN THE U.S.A. treats for their DOG! The give-away is open NOW…and will CLOSE at 5pm ET ON FRIDAY, MARCH 15TH. AND WILL BE ANNOUNCED WEDNESDAY, MARCH 20TH. Foodie Friday! I have Frosty Paws! Happy Furday everyone! It’s Dakota! Not only do I have “Frosty Paws” from our bitter and SNOWY Michigan weather, I was the LUCKY WINNER of a great give-away over at one of my favorite blogs, Dog Tested Mother Approved, a blog where they share “dog product reviews, tips and ideas” or, as they like to say, “the Tried and Chewed”. If you aren’t familiar with them, please check them out! So, wanna see what I won? Mom stole this photo from Dog Tested Mother Approved!! So what exactly did I win? And a “Frosty Mascot” toy! Now, I have to tell you a funny story. 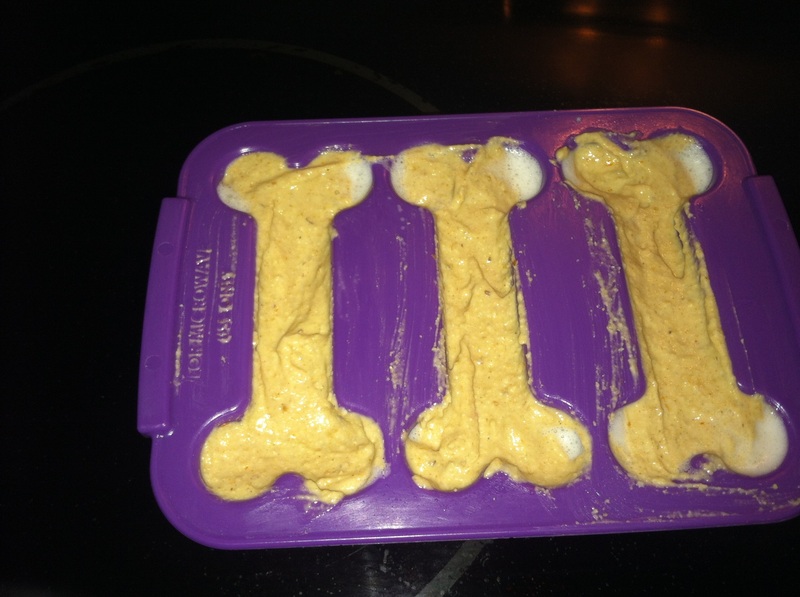 Mom was at the store last week and while she was looking for something decadent to indulge in stuff her face with for the Super Bowl, she stumbled upon the Frosty Paws in the human ice cream section! Of course she didn’t have her coupons with her, so she figured while she saw them in front of her face, rather than wait, she would buy a package for me. We hear Frosty Paws comes in peanut butter flavor and vanilla, Mom only saw the vanilla at our store, so she bought that one. Mom decided that I could have my Frosty Paws while she and Dad were enjoying pigging out on their frozen yogurt. WARNING!!! If you are a dog that inhales his food like I do, Mom has a warning for you! 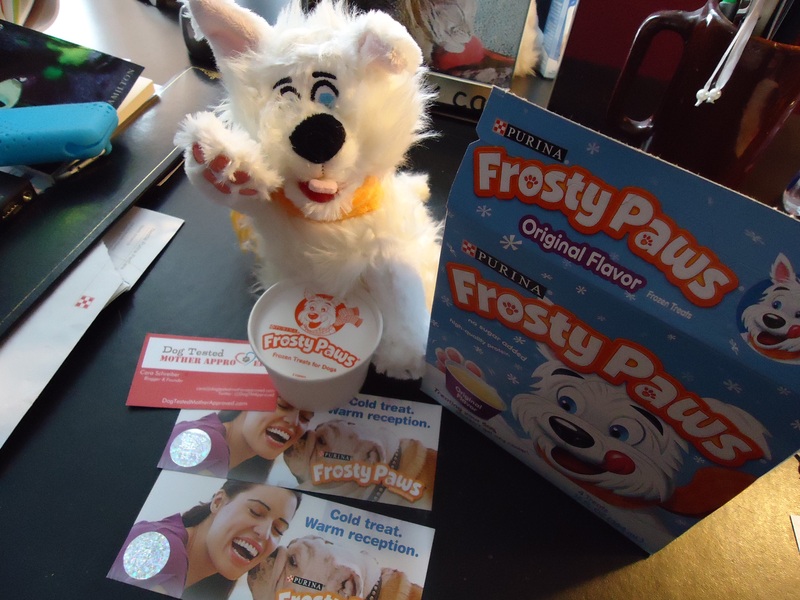 Be sure to thaw your Frosty Paws enough that you can mash it up in a bowl. WHY? Guess what I did?? Mom and Dad took the frozen treat out of the cardboard container and put it in my bowl, without thawing it a bit or mashing it up. Mom thought I would gingerly lick or nibble on it. Mom apparently forgot who she was talking about. I GRABBED THE ENTIRE BLOCK of frozen treat and ran while clenching the entire block between my teeth! I did my best showdog- lineage- prance around the living room, all the while STILL holding the frozen block of Frosty Paws with my teeth. I LOVED it so much that I had to take it to my special hide out under the dining room table where no human hands can reach me! Mom was screaming about how I would mess the carpet and Dad kept saying “Do you believe what he just did!!? ?” The best part? They never got it on video because I was too quick for them! I ate that baby up AND licked every bit up from Mom’s beloved oriental fake rug! Thanks Dog Tested Mother Approved for such a great give-away! Think about it, when was the last time you actually stopped to PLAY? I don’t mean playing a game on the computer, but the kind of carefree, kick-off-your- shoes- twirl- round-and-round- on- the- grass- til-you’re dizzy kind of play that you did as a child. The kind of play that brings on belly laughs that actually bring tears to your eyes. The kind of play that makes you feel exhilarated and free! It was probably some time ago wasn’t it? I know for me it was. There’s this thing called “life” that often gets in the way with responsibilities such as kids, paying bills, going to work and the constant onslaught of depressing news. I know I don’t often make the time to actively play, and I bet that you don’t either! According to a recent survey on the state of play in the U.S., 82-percent of the total adults surveyed say they don’t believe Americans are experiencing enough play in their lives*. Who better to inspire more play than our four-legged friends who bring smiles and spontaneity wherever they go? Logo courtesy of the Purina Beneful Facebook page. Click on the photo to “like” them! To help Americans get more play in their day, Beneful® brand dog food is launching a digital video campaign that features some fun-loving dogs that spread random acts of play in the most unexpected places. This last video is my absolute FAVORITE! The last video reminded me of when I attended the Meet Purina Pet Blogger Summit, and we had all convened in a meeting early in the morning. We were thrilled to be there and were delighted to listen to an assortment of speakers, but it wasn’t until 2 cats strolled into the conference room that the laughter, “ooohs and ahhhs”, and the giggles began! Purina “gets it”, that is why they allow their employees to bring their pets to work! Beneful® must know that if I am in need of play, Dakota must be too. Look at what they sent to us! 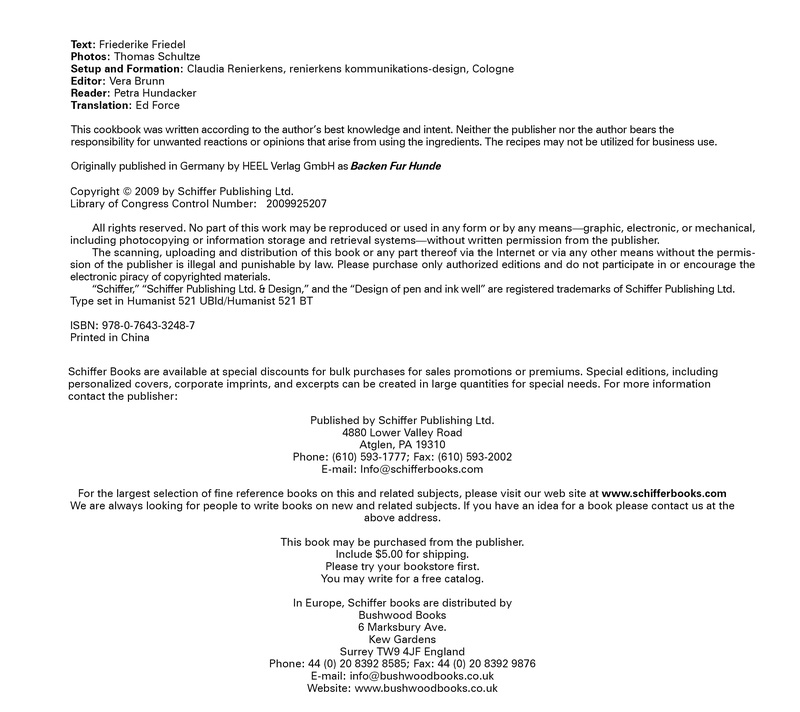 Click on the photo to visit the Beneful website! Isn’t this stuff just great? Dakota’s personal fave is the green tennis ball! He is all about the tennis balls! It’s not the same ball that he received but you get the idea! WINNER WILL BE ANNOUNCED WEDNESDAY, DECEMBER 26TH. You can also PLAY when you swing by PetSmart-if you purchase a 31-lb bag of Beneful and a 10 oz. 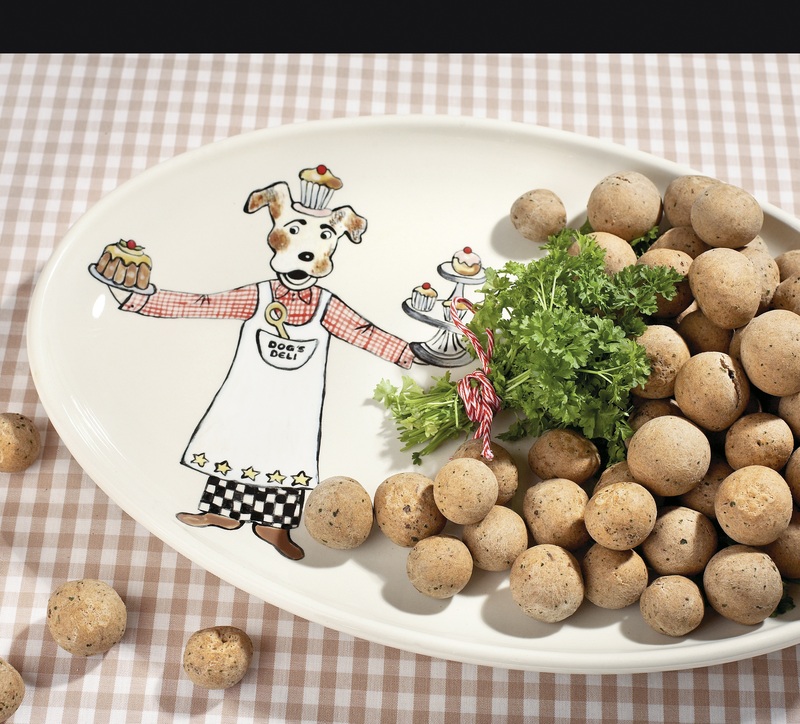 Beneful Prepared Meal, you’ll get a free toy with your purchase (there will be a special display of tennis balls right by the Beneful display). Just one more way Beneful is encouraging PLAY! We are also proud to tell you that the dog-loving community of Lancaster, Pa., has plenty of reason to play, as local resident Angela Bauman and her German Shorthaired Pointer, Beau, have been named Grand Prize Winner of the 2012 Beneful® Dream Dog Park Contest. Bauman wins $10,000 cash and a one-year supply of Beneful brand dog food. In addition, her creative entry for her ultimate play destination will help serve as inspiration for a $500,000 renovation of a dog park in the Lancaster area! The 2012 Beneful “State of Play” survey was fielded online by ORC International on April 16-22, 2012, among a sample of 2,024 American adults comprising 1,001 men and 1,023 women 18 years of age and older. The sample comprised 789 adults who own a dog. In Full Disclosure: I was not compensated for this post. 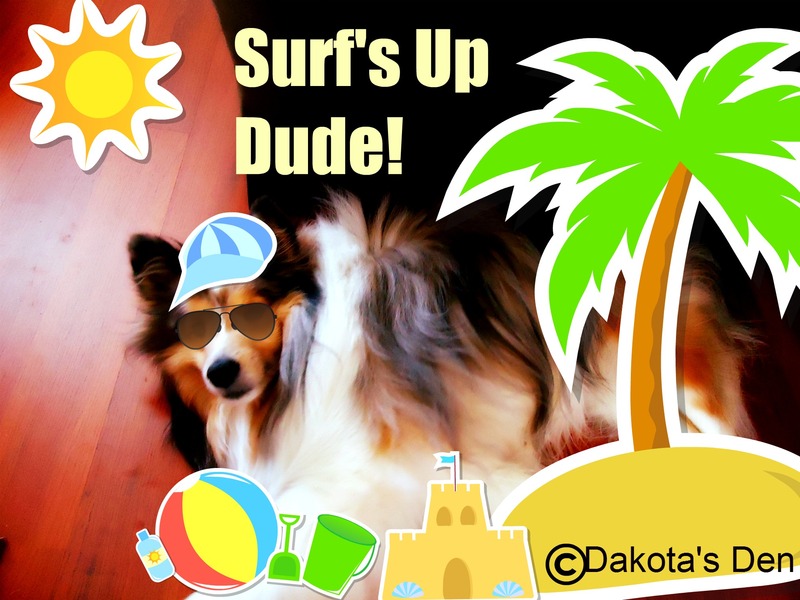 I am a member of the Purina Pet Blogger Panel and I was sent a Beneful® Play Pack for Dakota. I was given information to share with my readers if I chose to. Purina did fully pay for all expenses involving my visit to Meet Purina, this past October. Last week I presented the book Cooking For Dogs, if you missed it click here . As promised, today I am here to share with you, the first book of the series (yes, I know I am backwards!) 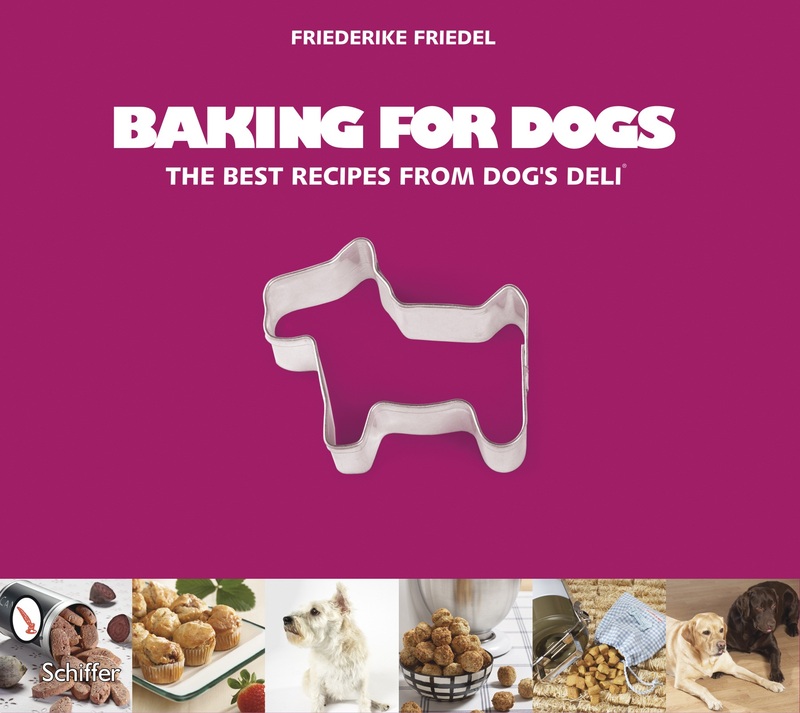 BAKING FOR DOGS, THE BEST RECIPES FROM DOG’S DELI by Friederike Friedel. I was delighted when perusing this beautifully photographed book and reading the recipes because there were a number of them that I am definitely going to be trying. Here are a few that are on my MUST BAKE list! Blueberry Scones-this screams Sunday morning or afternoon tea? 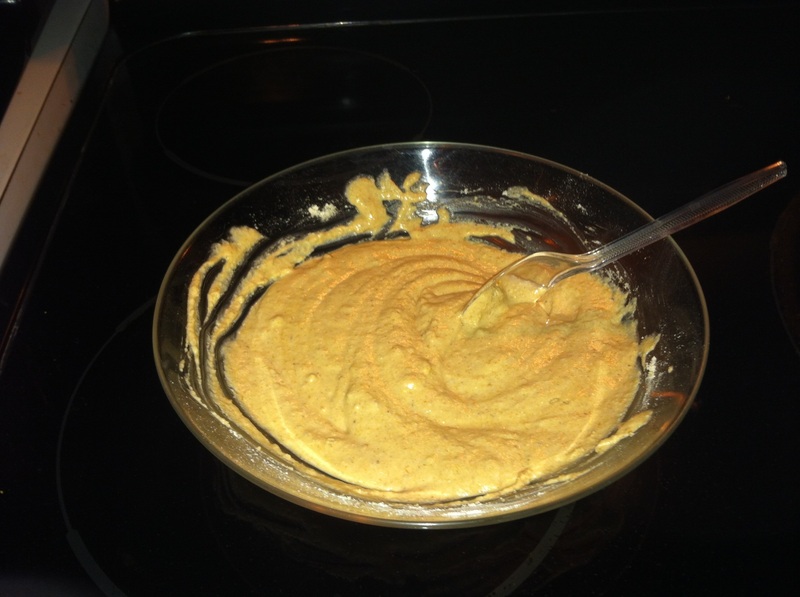 Cheese Sticks-the recipe for this sounds like a recipe that I have for humans! Yogurt With Fresh Fruit-yes I know this isn’t BAKING, I told you I am baking challenged, remember? Potato Chips With Parmesan-I just might be crunching on these with Dakota! Now I am NOT one that would ever eat Liver, but Liver seems to be on the I LOVE IT list for many dogs! From the author: Baking by following recipes from DOG’S DELI is child’s play. As a matter of principle, neither sugar nor additives, fragrances nor readymade products are used. You probably have most of the ingredients on hand at home. If you should get hungry yourself, go ahead and take a bite of one of your fresh-baked cookies. 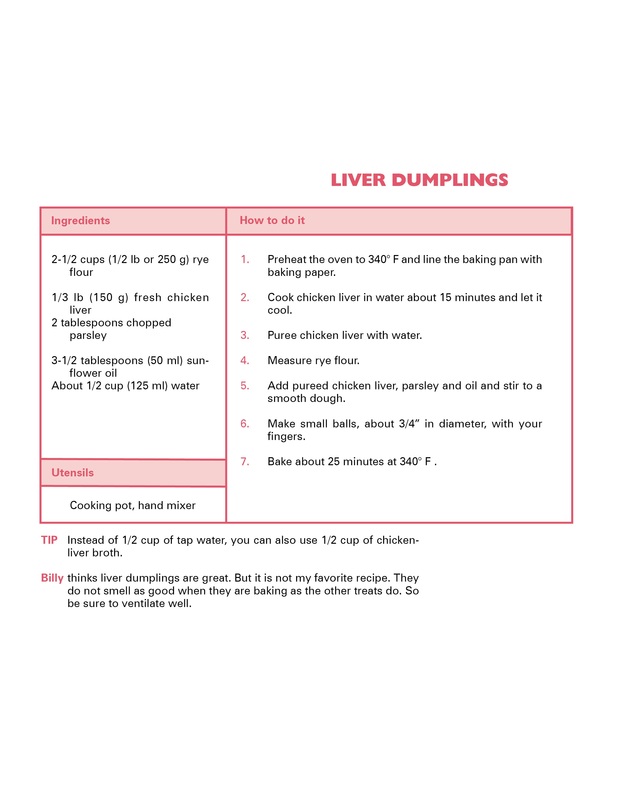 I had hoped to make a few recipes and let you know how they came out, but due to time constraints (among other things!) I was unable to. As the months go on and I do make a number of the recipes from both books, I will be sure to share with you! In the meantime, if you like to prepare wholesome, easy-to-make dishes for your dog, this book definitely should be a part of your cookbook collection! I am one LUCKY Dog! I have Rachael Ray Nutrish® Naturally Delish™ and guess what? YOU Can Too! If you are a regular reader of my blog it will come as no surprise to you to read that not only are my Mom and I obsessed madly in love with all things Rachael Ray, but I, in particular have eaten her Nutrish dog food practically since the day my Mom brought me home 5 yrs ago! I have featured it a few times on my blog (check my side bar! ), why? because I GENUINELY love the Nutrish line and I BELIEVE in Rachael Ray. Mom does too! Rachael Ray is a no-fuss, down-to-earth HOME COOK, not a fancy, uppity chef, but a REAL COOK who cooks REAL FOOD! She is also a REAL COOK who loves dogs. Rachael Ray likes her recipes to be “Simple” no-fuss. That’s why she worked with a team of pet nutritionists to create a line of food made with simple, natural and wholesome ingredients, you know, the kind that HER dog would eat! Rachael Ray Nutrish® is a super premium food for dogs! How excited were we when Rachael took her love of food, cooking and dogs and created a line of dog food that “foodies” and “dog foodies” would not only LOVE, but would feel comfortable feeding their pet? 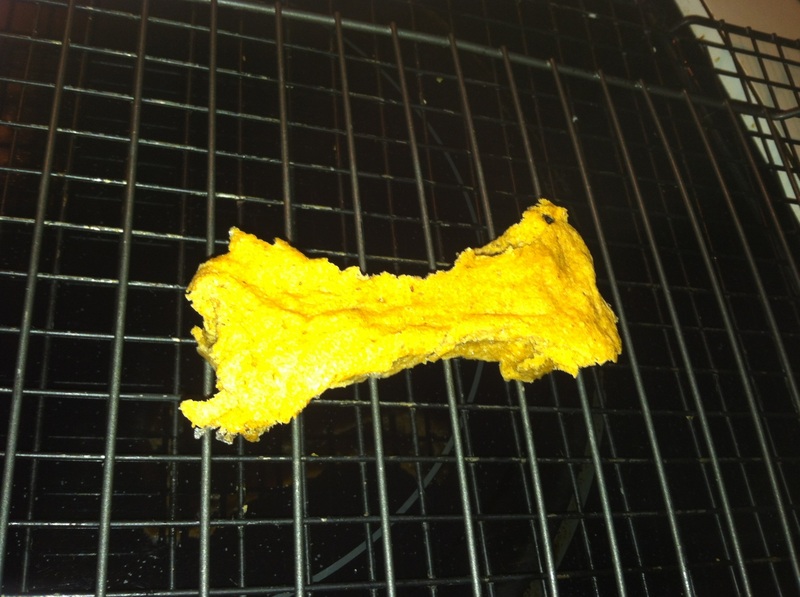 the FIRST natural wet food for dogs inspired by recipes from Rachael’s kitchen! You would run away with it too if you saw the four hearty and healthy flavors that it comes in! The first is a “signature flavor”: Chicken Muttballs with Pasta (the pasta in Chicken Muttballs contains semolina wheat flour). When Mom opened it to serve it to me it reminded her of one of her favorite soups, (Italian Wedding Bell!) it looked THAT GOOD! The broth looked like a broth that your Mom would make! Chicken Paw Pie—-(“Chicken Paw Pie” how CUTE is that??) Mom giggled when she saw that and when she opened it….Ohhhhh…well….see for yourself! Doggies, that is info for MOMS….what we care about is TASTE and I’m tellin’ ya Rachael Ray is all about food that tastes good and dog oh dog does this ever TASTE GOOD! Rachael’s Rescue was created for all of the forgotten pets — the ones that might not have someone who loves them as much as you love your pet. To date, proceeds from sales of Nutrish have gone toward food, medical supplies and treatments for animals in need. Many more shelters around the country need help, and through Rachael’s Rescue, together we can make a difference in the lives of many four-legged friends. And…you can ENTER OUR GIVE-AWAY! Just leave a comment telling us which flavor interests you the most (U.S. only please) and we will pick a winner by using www.random.org. DON’T DELAY!! ENTER TODAY!! This is a quick GIVE-AWAY! The deadline to enter is: MONDAY, AUGUST 6, at 11pm EASTERN. WINNER WILL BE ANNOUNCED WEDNESDAY, AUGUST 8TH!!!! This blog post is a sponsored post written by me on behalf of Nutrish for BlogPaws. But….ALL opinions are 100% MINE and my TUMMY’s!!! Tillman’s Treats By Natural Balance Compliments Of Mr.Chewy!! Hi everyone! It’s Dakota, and today I am taking over MY blog to tell you about something delicious that I have wanted to tell you about for quite some time. Mom and I were excited a few months back when we were contacted by Mr.Chewy (the online go-to for many of your pet’s needs such as dog and cat food and treats, pet health products, etc.!). My brother, Cody had been contacted by Mr.Chewy last year and he was so happy that he blogged about his experience. 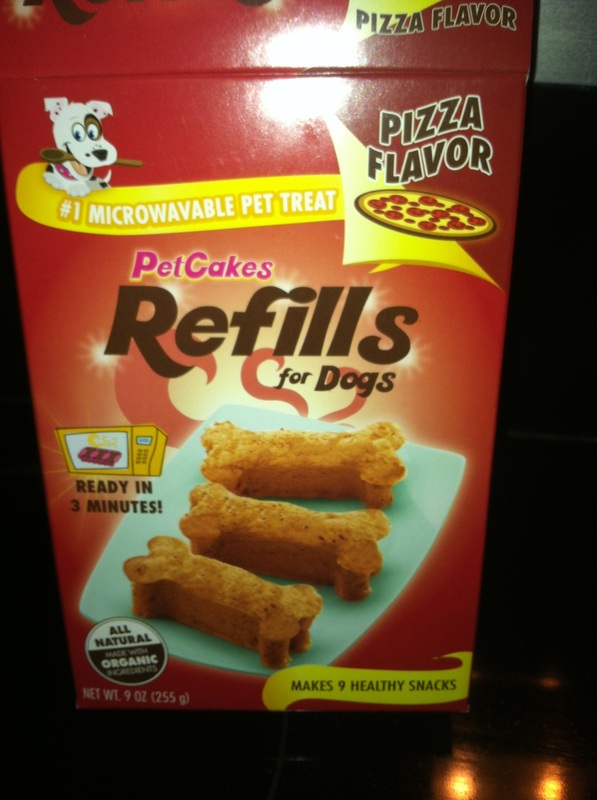 For my review, I was one of a few lucky dogs who were chosen to taste a super delicious treat! 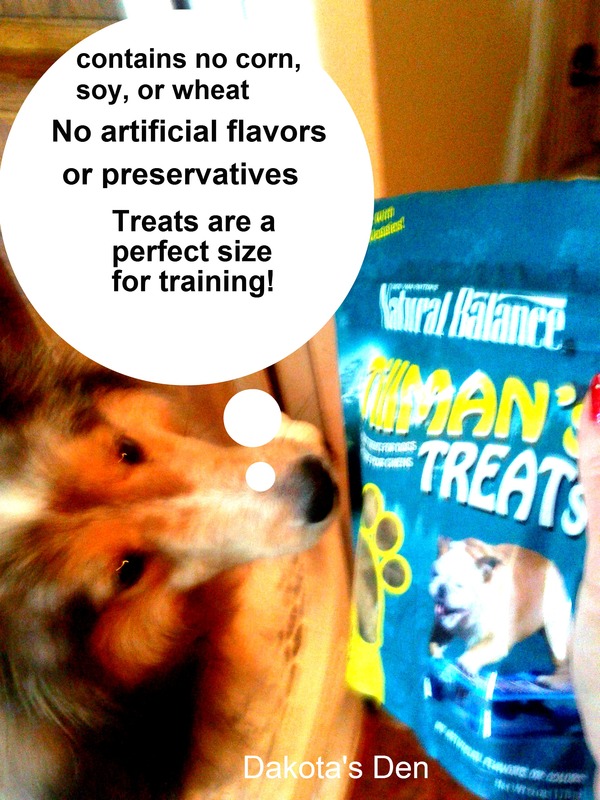 Tillman’s Treats made by Natural Balance Pet Foods. Oh My Dog they are delicious! I gobbled them up so fast that I was too fast for Mom to take a photo of me enjoying them! See Tillman on the package? Mom was so bummed because he was at BlogPaws and because Mom was sick she never got to meet him! Natural Balance products provide all-natural, complete, and balanced nutrition. They are used and respected worldwide by top trainers, breeders, veterinarians and kennels. They contain no corn, soy, wheat, artificial flavors or colors. You can read all about their products here. or the oven-baked crunch of Turkey, Oats & Cranberry Healthy Bones. They have ya covered! The cool part is Mr.Chewy offers the full line of Natural Balance food and treats for both dogs and cats, and they deliver directly to your doorstep!! Kinda like ordering a pizza eh? 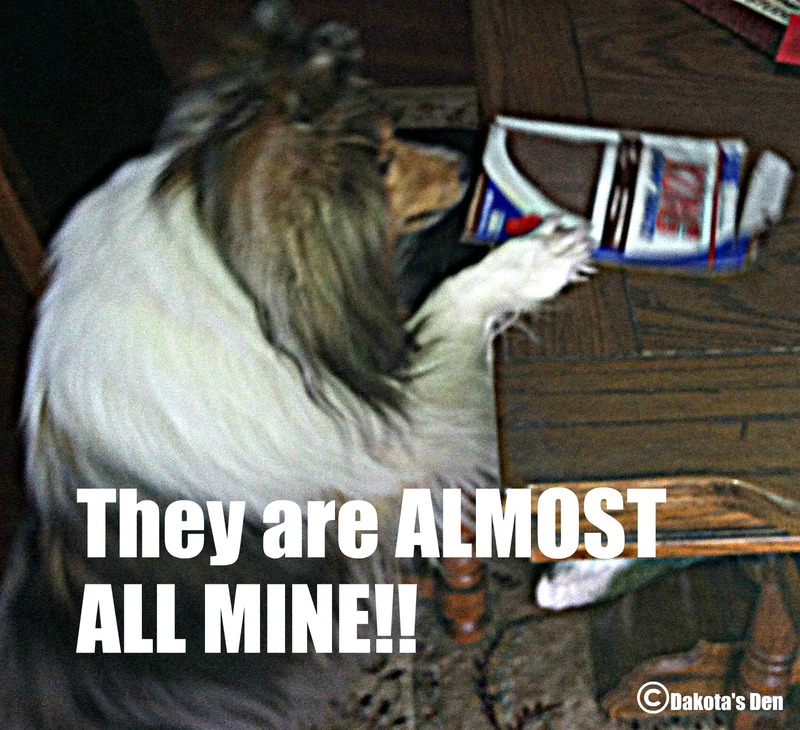 From my pawsonal experience Mr.Chewy delivers so darned fast that he is ALMOST as fast as the pizza guy….almost! He runs a good close second! If you want some deliciousness in your world and I KNOW that you do…start tapping that keyboard and visit Mr.Chewy NOW! I would like to thank Mr.Chewy for giving me the opportunity to taste these delicious treats!! In full disclosure. I was not compensated monetarily for this post. I was given treat samples to taste/review. I did not try the Natural Balance dog food.